Julia’s sister, Sara, has committed suicide. Everyone believes that Sara hanged herself after an operation to repair her eyesight was unsuccessful. Julia just cannot accept this conclusion. She is convinced that someone has murdered Sara. As a result, and despite her own failing vision, she decides to retrace Sara’s last steps in order to find out just what happened to her sister. Many horror films play on our deepest fears. Going blind is certainly one of those fears high on my list. And so, Julia’s Eyes was always going to trouble me. Add to that, the fact that this film is really creepy, spooky and features a number of genuine jump-scare moments and it was definitely time for me to hide behind a cushion! I am not exaggerating here. 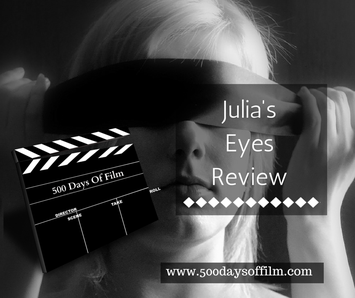 There is one excruciating moment in Julia’s Eyes (involving, you’ve guessed it - an eye) that I could hardly watch and what I did see was from around the corner of my cushion. Belén Rueda plays both Julia and Sara and she is superb. She needs to be as the entire film hangs on her performance. Having said that, the visual effects are great too - particularly when showing us Julia’s fading eyesight. However, the film did not, in the end, scare me as much as I thought it would. The ‘big bad’ was not actually as bad as the idea of slowly going blind and I did feel that the film lost its way towards the end. I felt in safe hands as soon as I saw that Guillermo Del Toro (Pan’s Labyrinth) was involved in the production. If I was Julia I don’t think I would be favouring heels..